Interested in Starting a Bed and Breakfast? A bed and breakfast (typically shortened to B&B) is a small lodging establishment that offers overnight accommodation and breakfast. Bed and breakfasts are often private family homes, and they have similar operational workings as a hotel, but on a smaller scale. The B&B Industry has an estimated worth of $3.4 billion. 5,700 square feet is the average size for a B&B business. The median occupancy rate for a B&B is 43.7%. The average daily rate for a B&B is $150. A typical B&B has between 4 and 11 rooms, with 6 being the average. The BLS reports 14,300 people work at bed and breakfast inns in the United States in 2016. The Professional Association of Innkeepers International indicates that there are approximately 17,000 B&Bs in the United States, serving nearly 55 million guests annually, as of 2009. [i] If this entrepreneurial journey sounds exciting to you, read on to learn how to start a bed and breakfast. 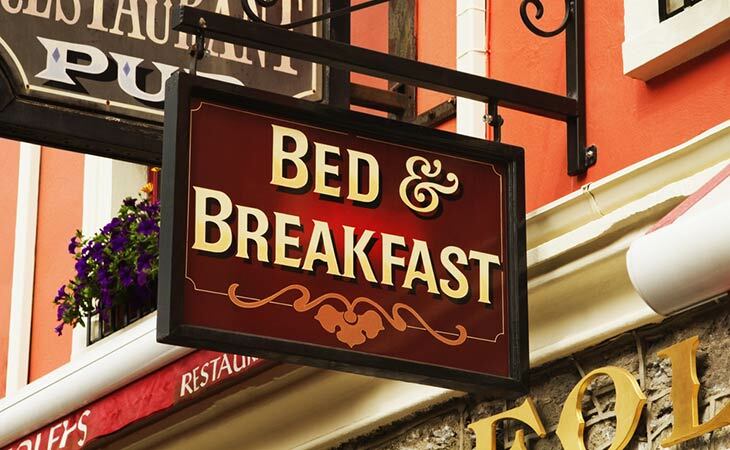 Before you decide to open a bed and breakfast, you’ll need to do your research. One of the largest decisions to make is where you will operate your bed and breakfast . A good location could be crucial for success. Look at the state and city’s Tourism and Chamber of Commerce organizations for census and revenue information. City and county licenses and permits differ greatly, so review your local requirements to see what you may need to apply for. Typical things you’ll need to inquire about include a certificate of occupancy, food certification, health department inspection, fire department inspection, liquor license, insurance, zoning and parking ordinances, and food service licenses. Check out other bed and breakfasts in the area, as well as alternative competition, such as chain hotels. If you’re purchasing an existing bed and breakfast or renovating an existing building, you’ll want to look into the building’s history, as well as what renovations may be needed. After your business’s location is decided upon, you could focus on researching your bed and breakfast financing options. Research how much you should be paying your employees on sites like the BLS. You’ll want to plan out your operational policies for both your employees and your guests, such as the hours you’ll operate, what types of payment you’ll accept, what food and drinks you’ll be offering, and other things specific to your B&B. You’ll also want to do some research into who your customers could be. Potential groups of customers could be tourists, business travelers, local residents, honeymooners, or people visiting a nearby college or getting treatment at a nearby hospital. Are you starting this B&B from scratch or buying an existing inn? Will the property need renovations? Services you’ll offer- What seasons/days/hours are you open? What does a stay entail? How many rooms will you have? The market- What are similar businesses in the area charging? Is there demand? What locations are in demand? Finances- Where are you getting the money from – loans? What are your fixed costs? How long will it take before you are making a profit? Personnel- Who will you need to hire and when? Marketing Strategy- How will you attract guests? Regulations - What are the requirements for zoning and licensing? A major factor in starting a bed and breakfast are the start up equipment and supplies you will need to account for. There are large supplies to consider, comfortable beds, kitchen appliance... and even possibly retrofitting the building for fire safety. While the large items may be financially daunting, there are many more small items to consider....toilet paper, towels, sheets, food, drinks, alcohol (hello liquor license), soap, Internet/WIFI, television..the list goes on. Depending on the size of your B&B, the number and nature of employees need to operate can vary greatly. Other factors such as location, business needs, and consumer demand may also influence exactly who you hire. It is very likely, that as you are getting off the ground, you may not have funds to hire anyone! You may need to be prepared to be the manager, cleaning lady and head chef! Revenue Managers – Revenue managers work in financial management, monitoring room sales and reservations, overseeing accounting and cash-flow matters at a property, projecting occupancy levels, and deciding which rooms to discount and when to offer special rates. Maids and Housekeeping Cleaners- These employees perform any combination of light cleaning duties to maintain households or establishments in a clean and orderly manner. Duties may include making beds, replenishing linens, cleaning rooms and halls, and vacuuming. Bookkeeper/Accountant/Auditing Clerk- Employees with these job titles produce financial records for organizations. They record financial transactions, update statements, and check financial records for accuracy. Grounds Maintenance Workers- Grounds maintenance workers ensure that the grounds of the business are attractive, orderly, and healthy in order to present a pleasant outdoor environment to guests. Licenses and certifications are a very important item to consider when starting your B&B - they vary from state to state, so check with your state to learn more. In addition, there are organizations that offer certification programs. AHLEI (American Hotel & Lodging Educational Institute) - The American Hotel & Lodging Educational Institute (AHLEI) strongly supports and encourages the certification of hospitality professionals in all facets of the industry. In order to become certified by AHLEI, you must meet the knowledge and experience requirements and successfully complete a certification examination. Certification examinations are available through AHLEI year-round using computerized adaptive testing or traditional print testing. HTMP (Hospitality and Tourism Management Program) - Aspiring high school students can enroll in this program, which is offered by the AHLEI (American Hotel & Lodging Educational Institute). The HTMP is a 2-year program that teaches management principles and leads to professional certification as a Certified Hospitality & Tourism Management Professional. PAII (Professional Association of Innkeepers International) –PAII is committed to fostering a knowledgeable, caring, and conscientious community of professional innkeepers, networking with each other throughout the world. You are also able to purchase industry information from this organization that may be invaluable to your decisions in starting a bed and breakfast. ABBA (American Bed and Breakfast Association) – ABBA is an organization dedicated to the promotion of bed & breakfasts nationwide. The first step in marketing your bed and breakfast may be to have an online presence. This includes creating a website, making social media accounts, adding your location to Google Maps, and submitting your business to local online directories such as Yelp. Additionally, you could advertise locally by partnering with other local businesses, attending local events and conferences, and implementing word-of-mouth and referral programs.